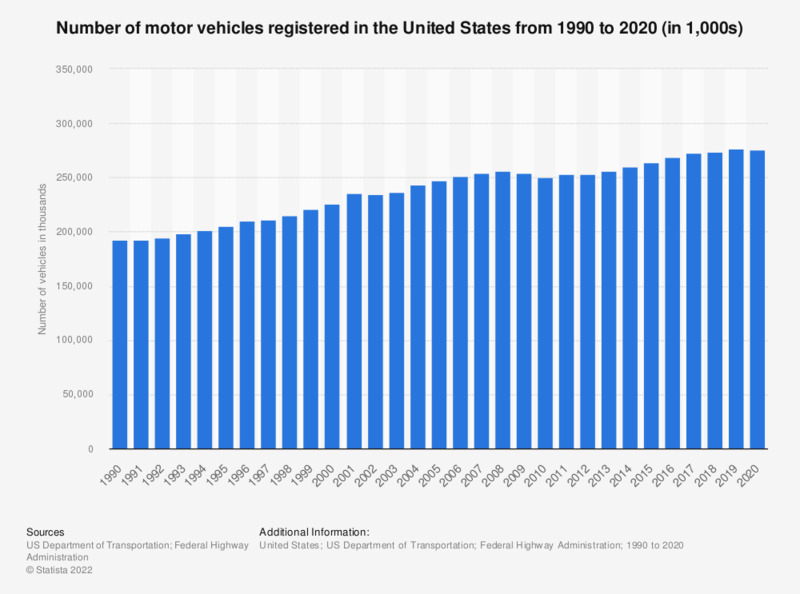 This graph shows the number of vehicles in the U.S. from 1990 through 2017. Some 272.48 million vehicles were registered here in 2017. The figures include passenger cars, motorcycles, trucks, buses, and other vehicles. The number of cars sold in the U.S. per year stood at 6.3 million in 2016. Second only to China, the United States is one of the world’s largest automobile markets based on the number of new light vehicle registrations, with around 17.55 million new light vehicle registrations in 2016. However, of the 68.6 million passenger cars produced worldwide in 2016, less than four million automobiles were produced in the U.S. While the United States imports a significant amount of vehicles from various countries such as Japan, Mexico and Canada, passenger car assembly within the country increased from some 2.2 million units produced in 2009 to a little under four million units in 2016. Toyota and BMW are the leading carmakers selling imported cars in the United States. The leading car manufacturers overall in the United States include the Detroit Big Three automakers: General Motors, Ford and Chrysler; today, Chrysler is fully owned by Fiat though. With respect to car brands, the Ford brand clocked in at number one in 2016, selling around 2.5 million vehicles in the United States alone. The brand's holding company is the Ford Motor Company; it was founded by Henry Ford in 1903 in Dearborn, Michigan. The company pioneered in large-scale car manufacturing and introduced production methods such as the assembly line. Ford is one of the world’s largest automobile manufacturers, with 2016 revenue of just under 152 billion U.S. dollars. The figures for 1990 through 2011 are taken from table 1-11 of the National Transportation Statistics 2013 report, published by the US Department of Transportation in 2013. The figures for 2012 through 2015 are taken from previous Highway Statistics editions. Vehicles: passenger cars, motorcycles, other 2-axle 4-tire vehicles, single-unit 2-axle 6-tire ore more trucks, combination trucks, buses.